Draw the Dog is a wonderful cartoon series at drawthedog.com that celebrates the magical relationship between dogs and their owners, and its creators are a huge supporter of rescue, which we love! They allow any nonprofit rescue group or shelter to use any of their cartoons to create and sell T-shirts they can use as fundraisers. 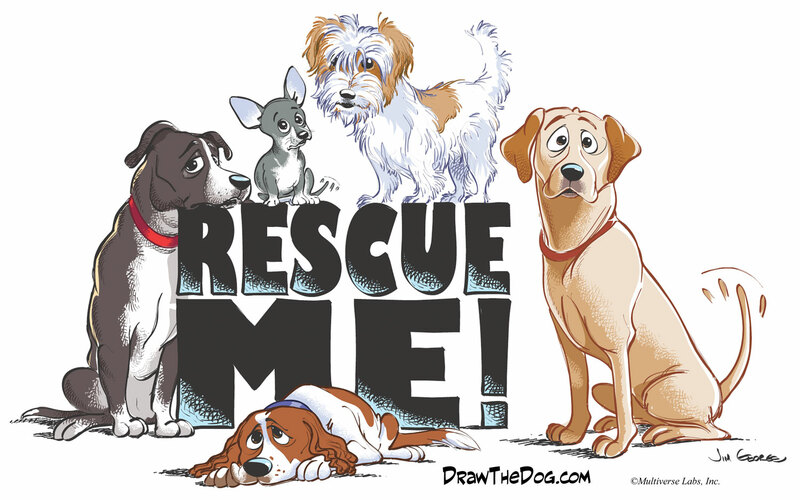 They even have created some art especially for rescue groups, like the cartoon you see here (click on it to see a larger version). They feature cartoons inspired by photos and stories owners send in about their dogs, such as the two Great Danes who let themselves out a window onto the roof of a porch, or the Pit Bull who goes everywhere with her stuffed teddy bear in her mouth. Draw the Dog has generously offered to let the AdoptaPet.com blog feature one cartoon guest post a week! So every Wednesday check back here for another one of their ‘pawsome’ cartoons.